Korean Airlines Flight 858 flying from Abu Dhabi to Seoul, exploded over the sea near Burma, killing all 115 passengers and crew members on board on 29th November 1987. It later emerged that two North Korean agents, Kim Hyun-hee and Kim Sungil, had conducted the bombing mission upon receiving orders from their superiors to disrupt preparations for the upcoming Olympic Games in South Korea. The two agents posed themselves as father and daughter tourists from Japan, and travelled to Moscow, Budapest, Vienna, and Belgrade before arriving in Baghdad on 29th November. The two boarded KAL 858 with the purpose of programming the IED, disguised as a transistor radio (combined with a bottle of liquid explosive to intensify the blast) to detonate after nine hours. Kim Hyun-hee and Kim Sungil disembarked in order to transfer to Bahrain and the IED exploded as planned after nine hours over the Andaman Sea, killing all 115 passengers and crew. Moving swiftly after news of the plane’s disappearance, authorities became suspicious about “Mayumi Hachiya”, a 25-year-old Japanese woman travelling with her father and registered on the first leg of KAL 858 from Baghdad to Abu Dhabi. On 31st November, at the airport in Bahrain where the two had flown in an attempt to get home from Abu Dhabi, they were apprehended by police as they were about to board a flight for Rome. The elderly man, Kim Sungil, who turned out to be a veteran North Korean secret agent, bit into a cyanide-laced cigarette and died instantly. A police officer grabbed a similarly poisoned cigarette from Kim Hyun-hee. At first, with her interrogators Kim Hyun-hee stuck steadfastly to a cover-story that she was a Chinese orphan who had grown up in Japan and who had had nothing to do with the bombing. But her actions belied her story. In one violent outburst in Bahrain she attacked a police officer and attempted to grab his firearm, but was overpowered. Chief among the evidence was an analysis of the cyanide-laced cigarettes, which showed them to be the same type used by North Korean agents apprehended in South Korea. Kim Hyun-hee was transferred to South Korea and on the eighth day of her interrogation by South Korean security agents, she confessed saying in Korean, “Forgive me. I am sorry. I will tell you everything.” She admitted to helping place the radio time bomb with liquid explosive in the overhead luggage rack of KAL 858 while on the Baghdad to Abu Dhabi leg and then deplaning with her fellow agent. Kim Hyun-hee revealed that the two North Koreans had been travelling overseas, disguised as father and daughter, for more than three years in preparation for the operation. Following the bombing of KAL 858, the U.S. put North Korea on its list of countries engaged in terrorism. 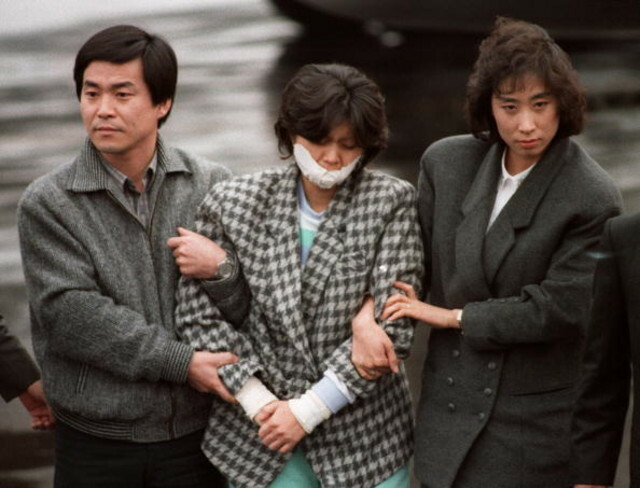 For her role in the bombing of KAL 858, Kim Hyun-hee was sentenced to death in March 1989 but was later pardoned by South Korea’s president, Roh Tae-woo. His reasoning to the world was: “The persons who ought to be on trial here are the leaders of North Korea. This child is as much a victim of this evil regime as the passengers aboard KAL 858”. Kim Hyun-hee later wrote her autobiography entitled “Tears of My Soul” and donated the proceeds to the families of the victims of Flight 858. In her book, Kim Hyun-hee described how she grew up in a country obsessed by the loss of South Korea, an Orwellian world where right and wrong, good and evil, slavery and freedom meant nothing but what the North Korean Communist Party said they did. At sixteen, she was singled out by the Party for her intelligence and beauty and given special training in languages. At nineteen she was honoured to be chosen for the North Korean Army’s secret and elite espionage school. There she was trained to kill with everything from her hands and feet to grenades and assault rifles, enduring years of gruelling physical and psychological conditioning designed to make her an effective and utterly obedient tool of the Party’s spy masters. And in 1987, at age twenty-five, she was sent on the bombing mission that would, she was told, reunify her divided country forever. Kim Hyun-hee now lives in an undisclosed location and remains under constant protection for fear of reprisals, from either victims’ families or the North Korean government which has branded her a traitor.